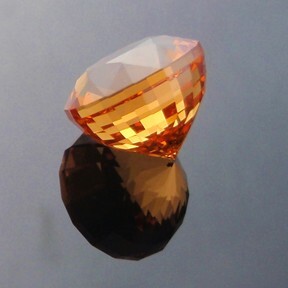 Comments : This asscher cut Tanga garnet is a very fine gemstone. 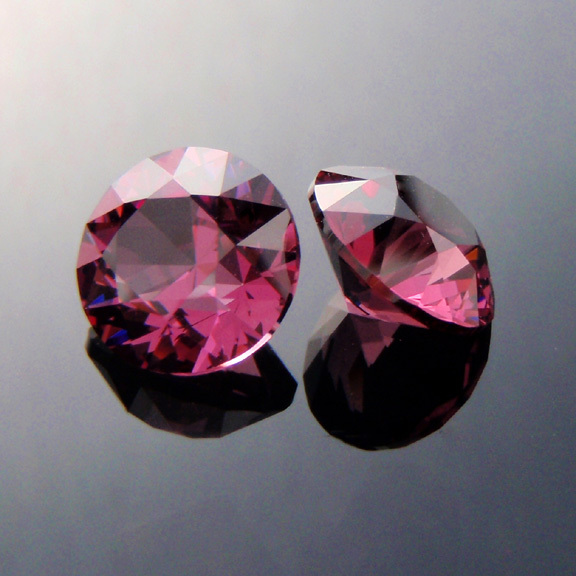 The saturation is just right and the colour is a pinky raspberry. 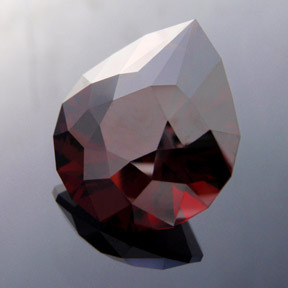 It would make a perfect ring stone. Comments : These magnificent mandarin spessartite garnets from the Loliondo depost in Tanzania are among the finest of this type of stone. 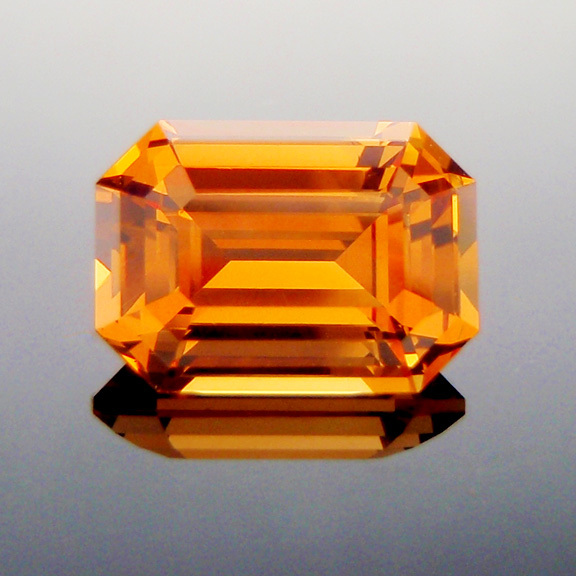 This gem has the bright and vivid fanta orange colour that is so highly sort. 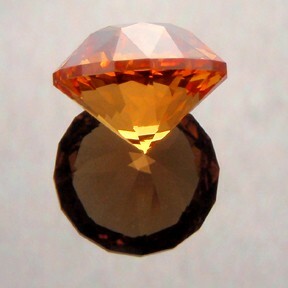 It is well saturated with colour and suits my favourite Antique Round 1910 design. 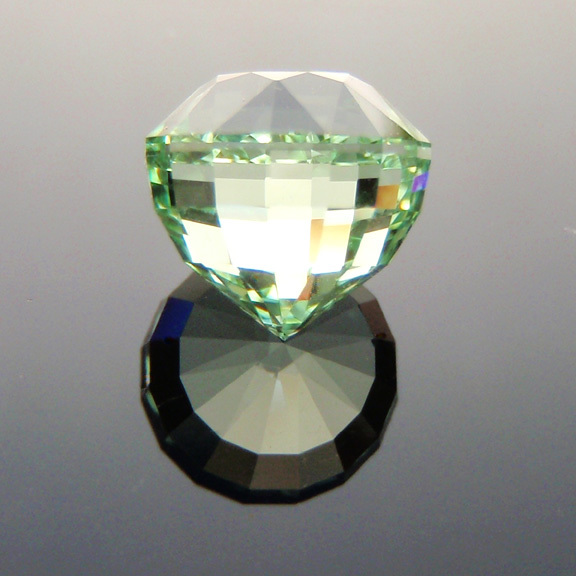 The gemstone is very bright and flashy and for this gem I have smoothed, rounded and polished the girdle rather then leaving it faceted. 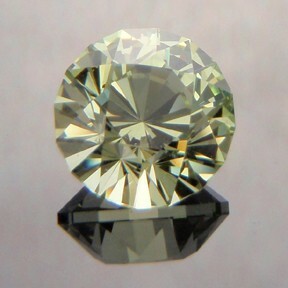 Sizewise, it is a smidge under 8mm so it should fit settings without any difficultly and the weight is a good 3 carats. 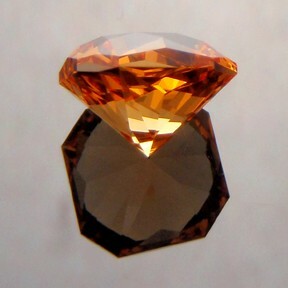 Now, with the pics I do want to point out that they do look more brown then the gemstone actually is. This is simply a problem I have always had with photographing gems in the yellow/orange spectrum. 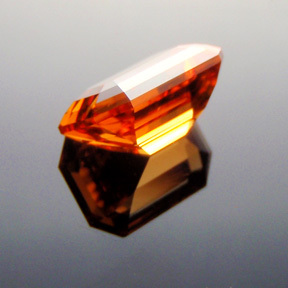 I just need you to imagine the stone with less brown and more orange/yellow. 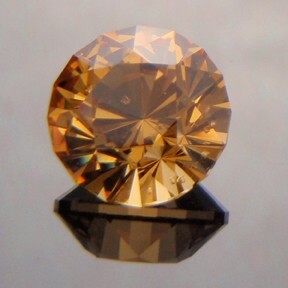 Please remember that even though I try to get the colour as accurate as possible, pics can never really catch the true colour and beauty. 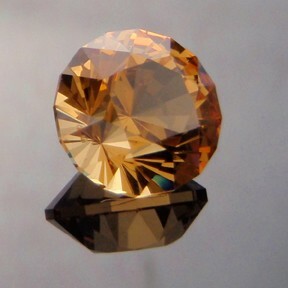 If you were to ask me whether it had a "brown" mask/modifier I'd have to be honest and say that its really hard to tell. 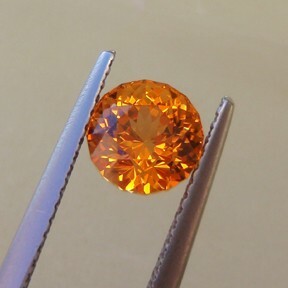 If its there then its very minor and subtle, again please don't judge the stone by the pics. 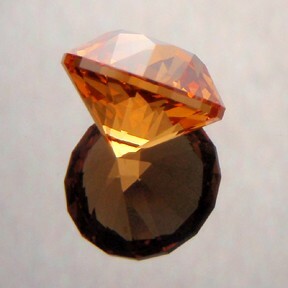 Also, when does dark orange become brown? So please bear all that in mind. 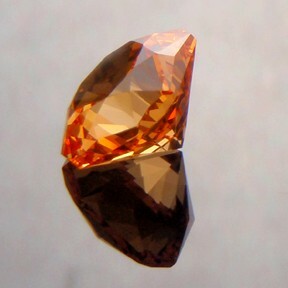 The gemstone does have the inclusions that are common to this type of garnet. 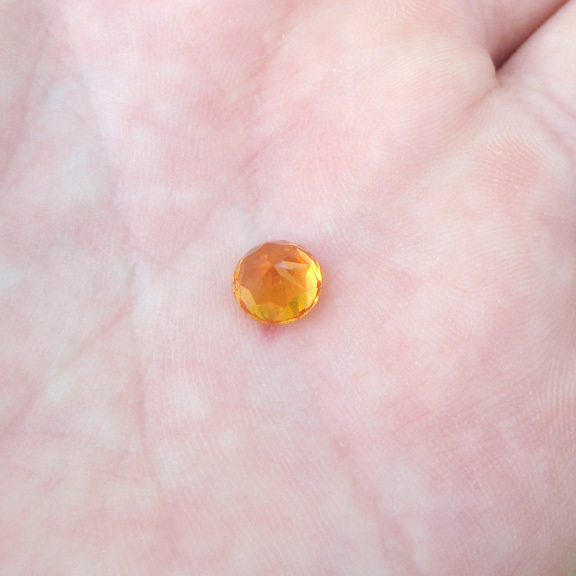 Its a sort of small speckle kind of inclusion. 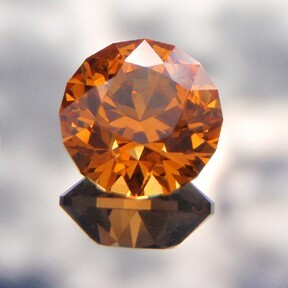 It is noticable when veiwing the stone but not as much as the pics might make out. Inclusions to some degree are to be expected with this sort of garnet, much like that with emeralds. 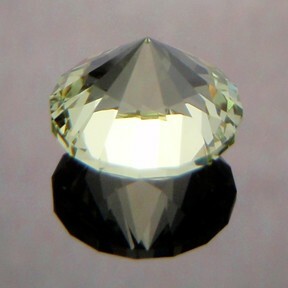 The photographs were all taken outdoors using early morning natural difused sunlight. 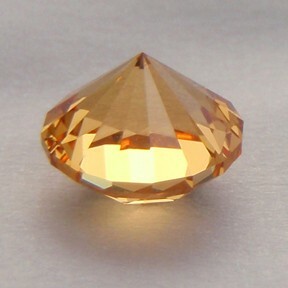 I like to use sunlight as I believe it represents the stone as naturally and realistically as possible. 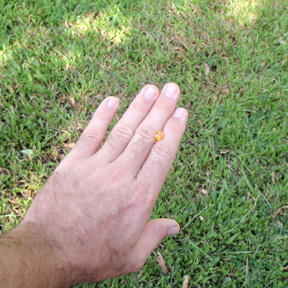 The "hand shots" were taken outdoors under the shade of a mango tree. 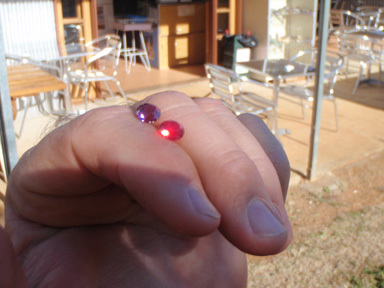 These in particular seem to show the colour well, I think. 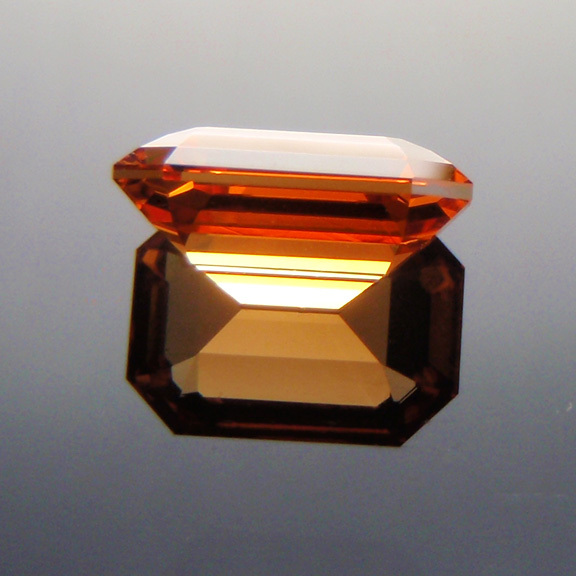 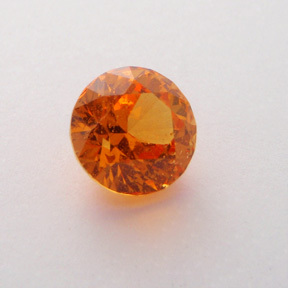 All in all, this is a very fine fanta orange mandarin spessartite garnet from Loliondo. 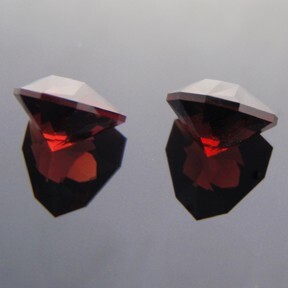 These gems, in good sizes like this, are becoming harder to obtain. 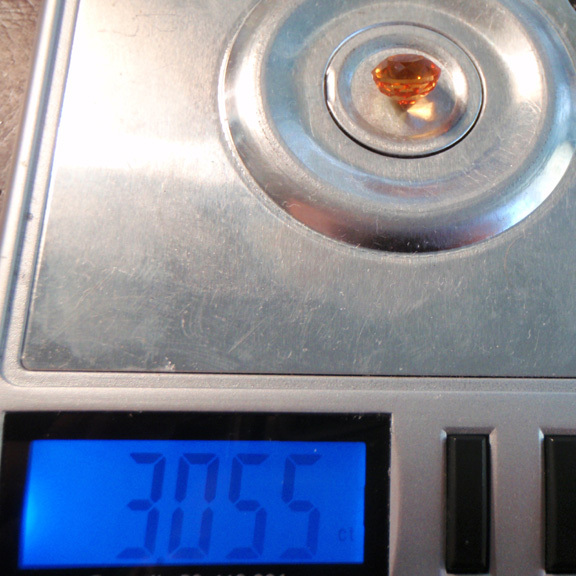 Prices for good quality rough has risen considerably over the last 12 months. 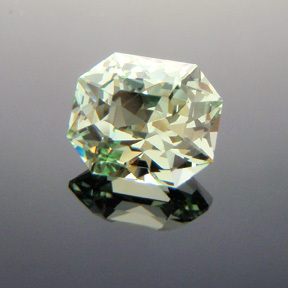 This gem is ideally suited for a ring setting. 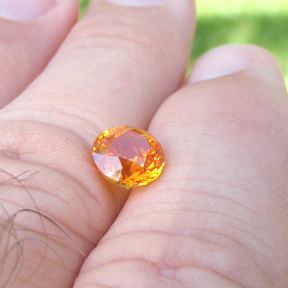 * Suggested wholesale price per carat for a gem of this size, type and quality ranges from $500 - $650 USD. 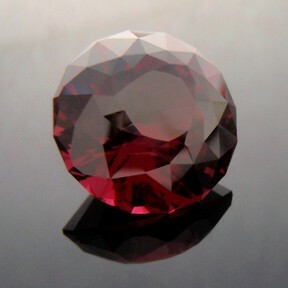 Comments : Nice deeply red coloured rhodolite garnet cut in an antique style round. 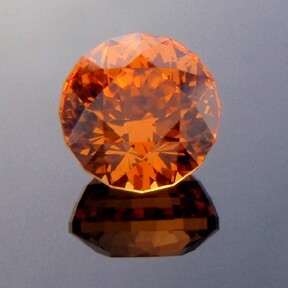 This is a beautiful gem in a good size. 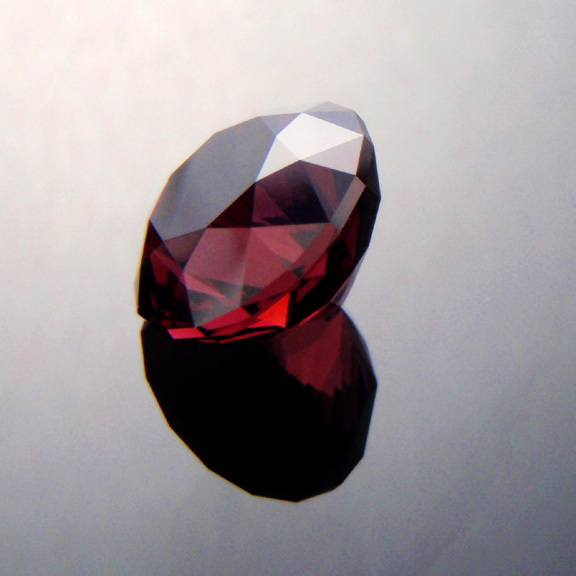 There is a touch of silk inside the gem. 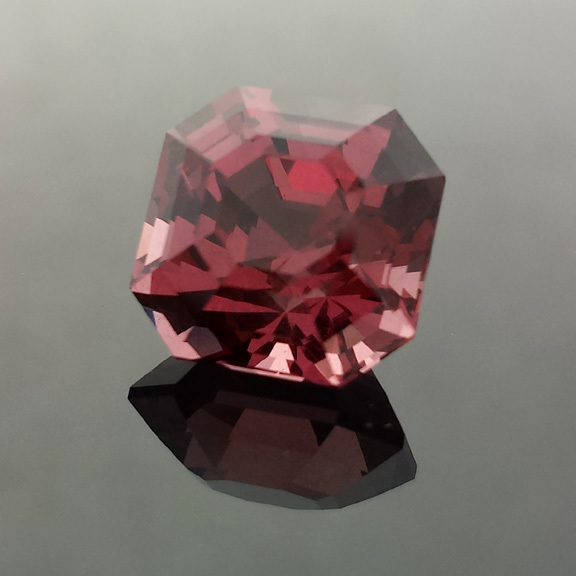 Quite a wonderful rhodolite garnet gemstone. 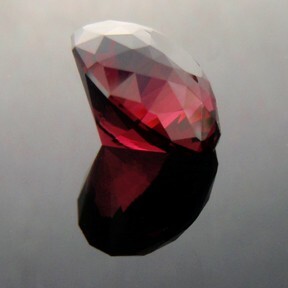 Comments : This is a luscious rich red rhodolite from Tanzania. There are strong vibrant red tones with purple/pink/plum overtones and is beautifully eye clean. 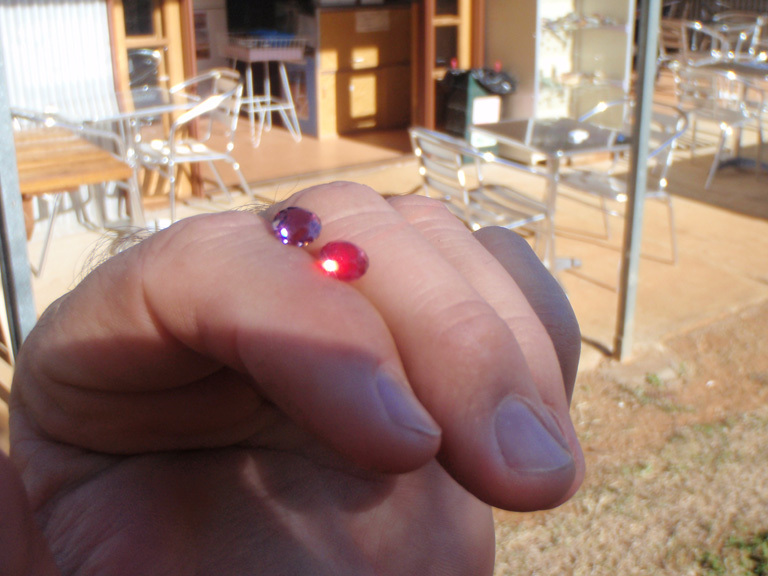 It has very good scintillation with eye catching violet purple sparkles... when I first took it out into the sunlight to admire it I was surprised by this violet sparkle as I wasn't expecting it. 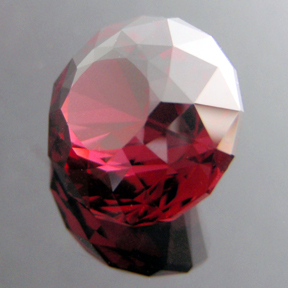 This is a very fine rhodolite and is cut in my own 161 faceted "Phi Flower Dome" design. 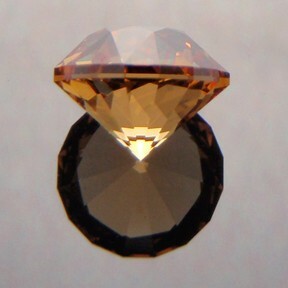 I had in mind that it would look fantastic set in a solid gent's gold ring. 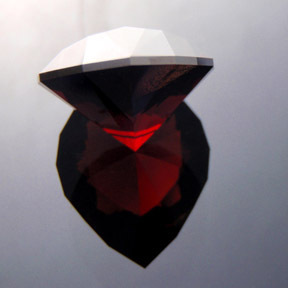 This would certainly be a special setting if you went in this direction. 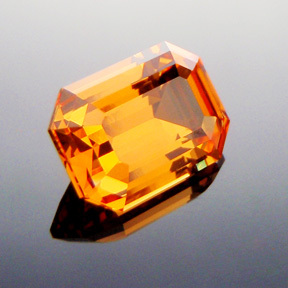 A very beautiful gem! 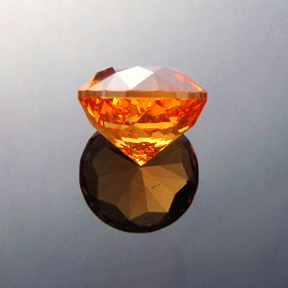 Comments : Here is a classic pair of Umbalite garnets cut in a round brilliant style design. They are a matched pair and are ideally suited for a pair of earrings or studs. They should fit any standard setting without any difficulty. 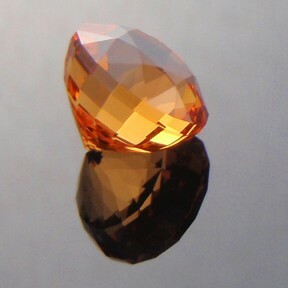 The colours are classic Umbalite and in the sunlight or under lights there are strong flashes of blue and red/orangy-red. 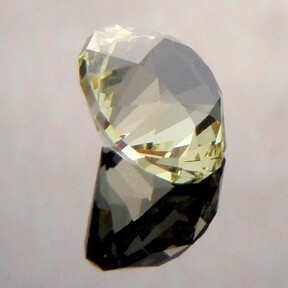 One stone appears to be eye clean while the other has a very minor inclusion right on the girdle which comes through to the surface there on the girdle/pavilion edge as tiny scratch-like (maybe <= 0.5 mm in length). 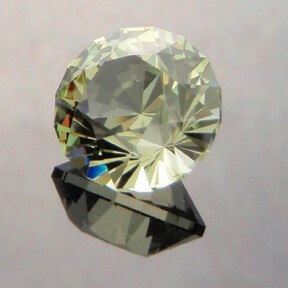 These do not detract from the face-up appearance of the gem and will in all likelihood be hidden when set. 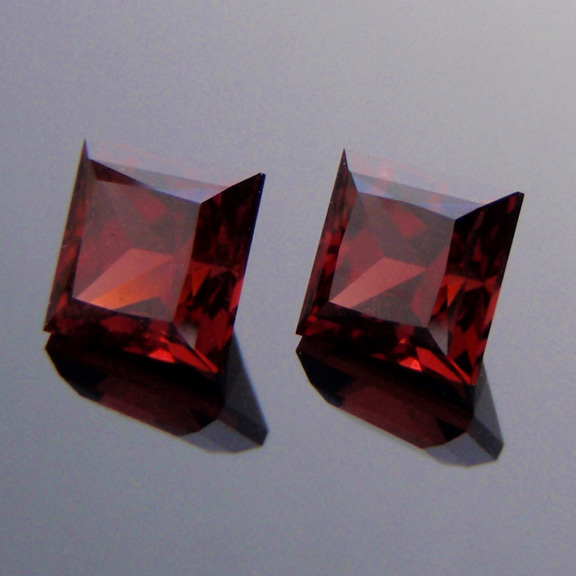 A very pleasing pair of Umbalite garnets. Comments : A spectacular Merelani mint green garnet that has the classic colours associated with the garnets that come from the Merelani Hills region of Tanzania. 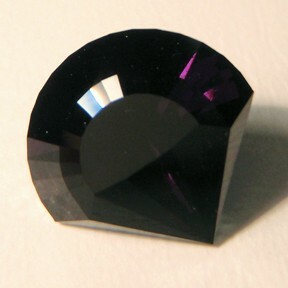 This gem shows alot of dispersion with a full chromatic fireworks of bright sparkles to be seen. 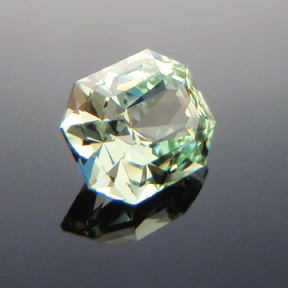 At night under a single incandescant lightblub this gem is a beauty and I swear I could see light blue neon flashes that were really attractive. 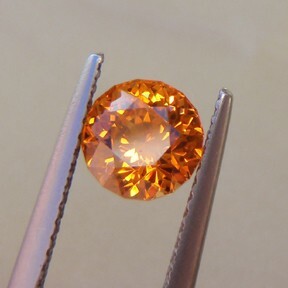 There is heaps of fire with a lovely touch of neon blue in the sparkles. 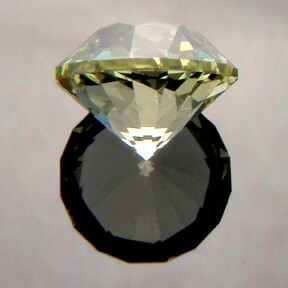 The design is my Acorn design and I think this gem would best suit a white metal, like white gold or platinum. 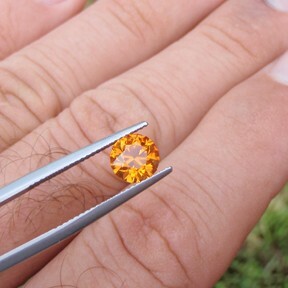 It is a good size for this material which tends to be small. 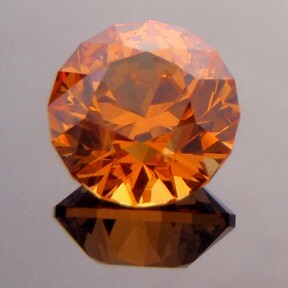 A very lovely gemstone! 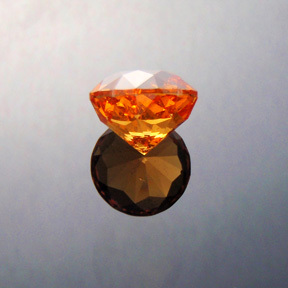 Comments : This is a superb matched pair of lovely umbalite garnets from Tanzania. 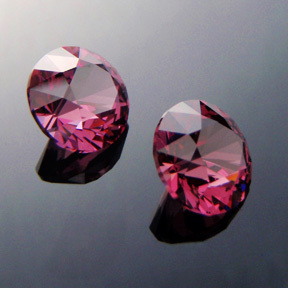 The colours are beautiful, being the classic pinky purple tones. 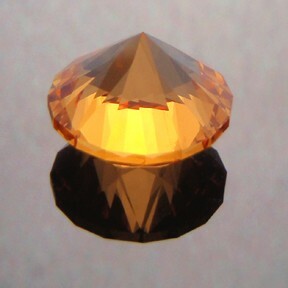 The saturation is a medium light and gems look stunning in both the day and night. 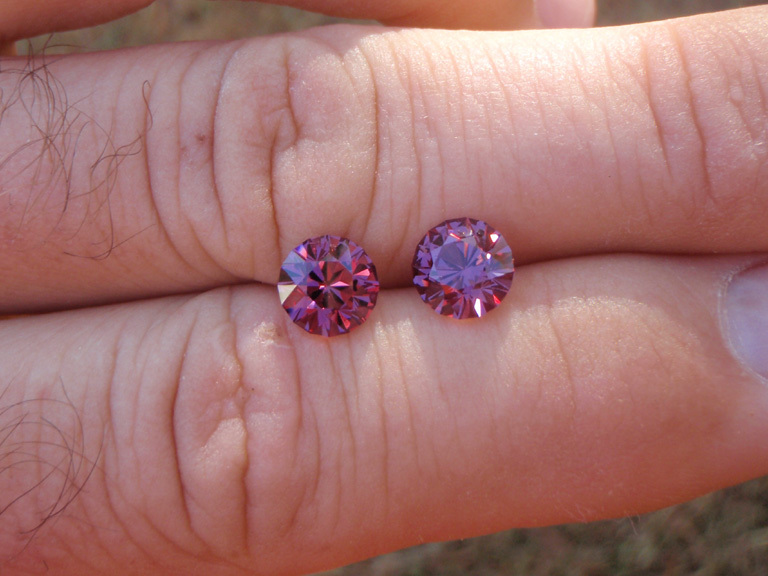 The two gems have alot of sparkle and flash and are nice and bright. 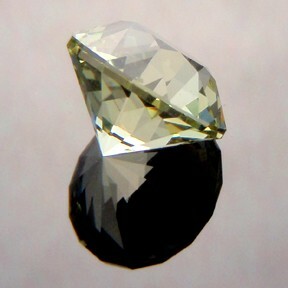 One stone has a slightly lower crown but only just... 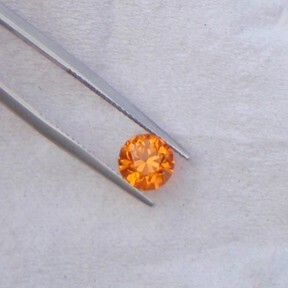 I had to dodge an annoying inclusion when cutting it so that I could get an eye clean stone. The difference in crown height is negligible and once set would not be noticable. 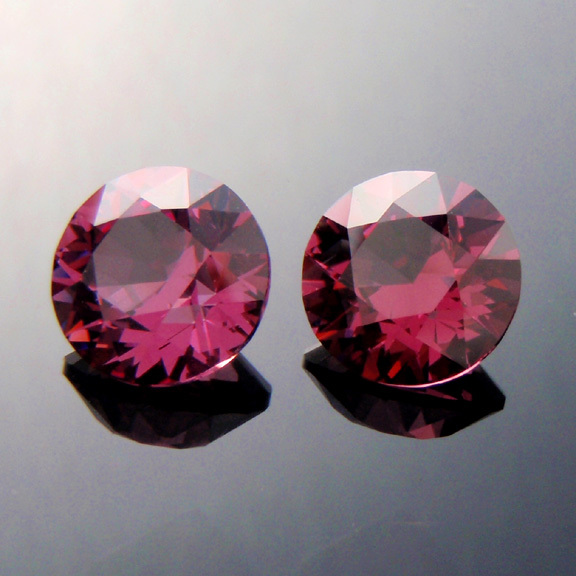 Ideally these gems would suit a pair of earrings or studs. 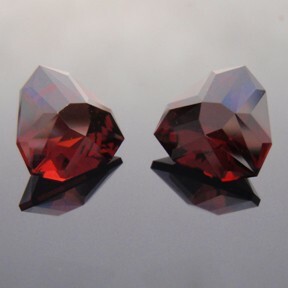 A very fine pair of umbalite garnets. 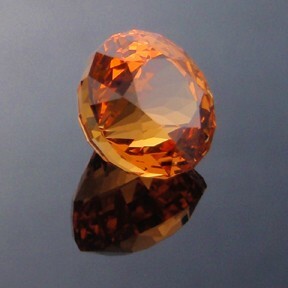 Comments : A totally awesome fanta orange mandarin spessartite garnet! This stunning gemstone is cut in the classic Emerald Cut and shows off the colour superbly. 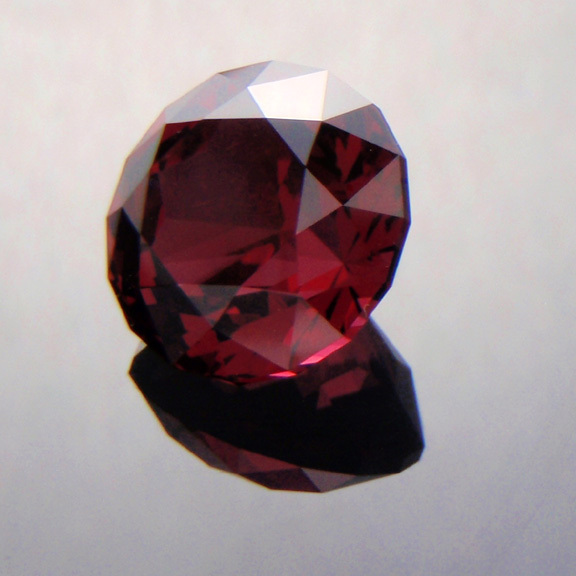 The gem is so much better in real life, as they all are. The camera can never do justice to the true beauty of gemstones though we do try to capture as best as possible the colours. The gemstone is cut to a calibrated size so it should easily fit most standard settings without any difficulty. It is eye clean and the colour is that highly desirable fanta orange. 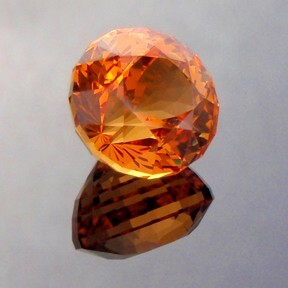 A top class mandarin garnet gemstone! 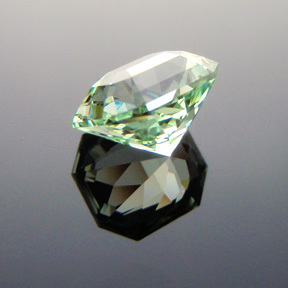 Comments : Merelani mint green garnet is among the rarer types of garnets. The colour of this beautiful gem is the classic mint green that this material is famous for. The gem comes from the Merelani Hills region of Tanzania and the deposits are quite small and less and less is being found. 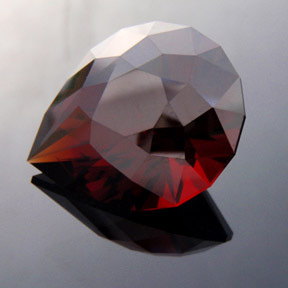 This type of garnet cuts an exceptionally bright gem with incredible dispersion producing a fireworks of sparkles. 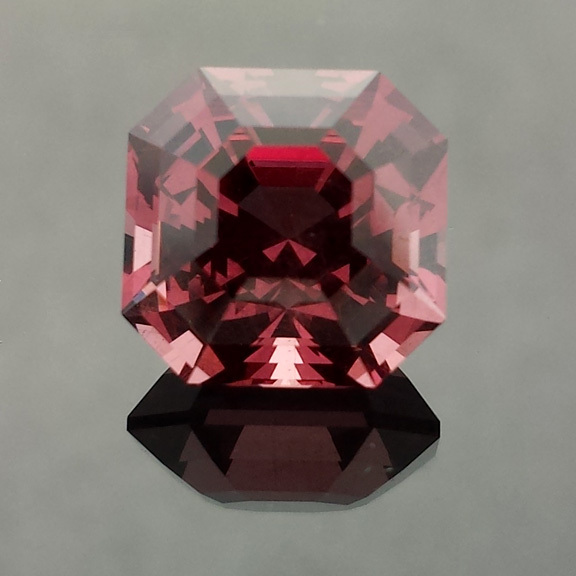 The Radiant Emerald Cut design is a top little performer and really shows off this garnet well. I've given this gem a clarity of eye clean / very very slightly included because I noticed when I was doing the final polish that there appeared to be some very small "sparkle" like inclusions. 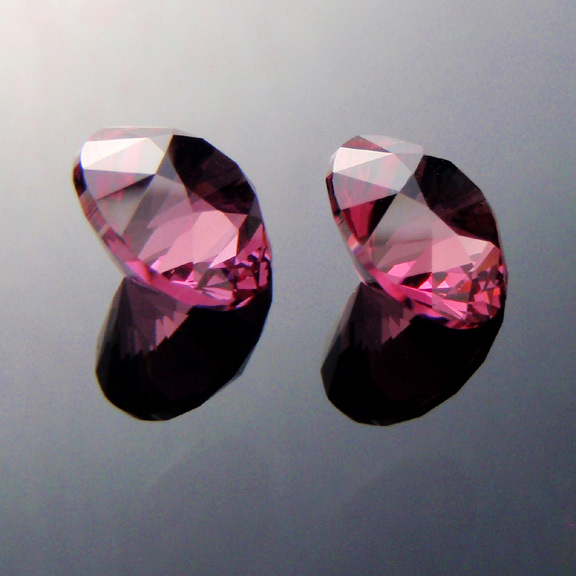 I needed a loupe to see them but even then it was hard to see them clearly. 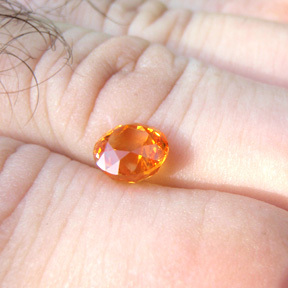 Therefore, for all practical purposes I think it is eye clean. A really sweet little gem! Comments : A top shelf fanta orange mandarin spessartite garnet gemstone, stunning in every way! 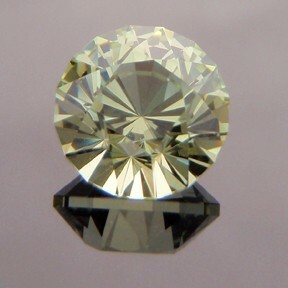 The design is one of my favorite classical round cuts. 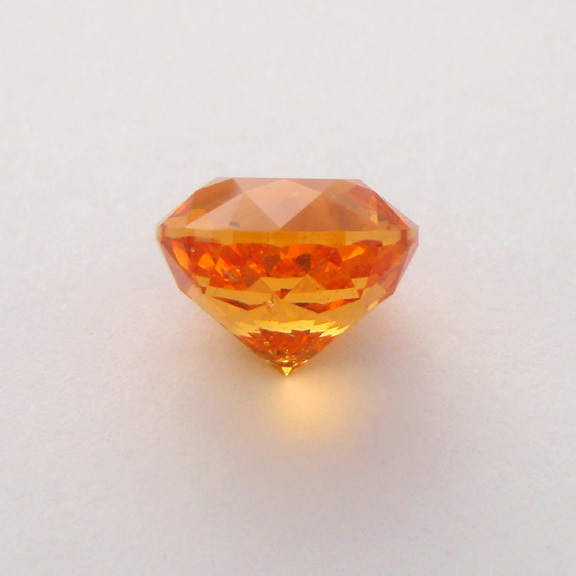 It is based on a gemstone that was cut circa 1910 and is perfect for this fanta orange coloured garnet. 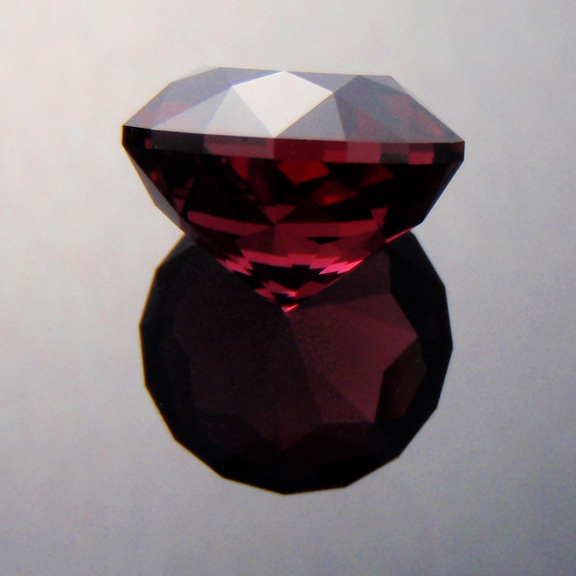 It gives the gem that special "something" that separates it from the pack. 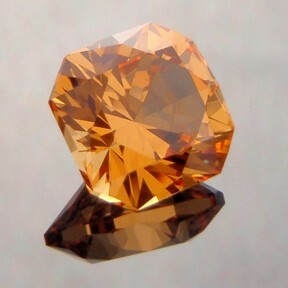 I really like this gem. 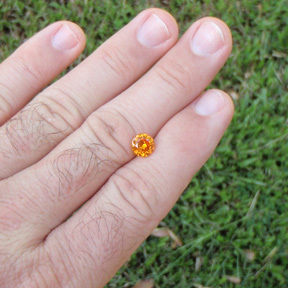 It is a perfect size for a ring and deserves a great setting. 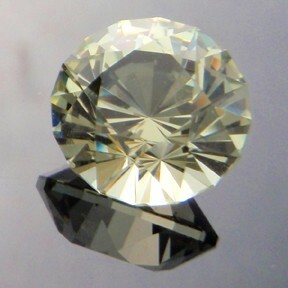 When I was polishing the gem I noticed some very small sparkle like inclusions and what I think is a very tiny veil near the girdle... even with a loupe they were hard to spot. 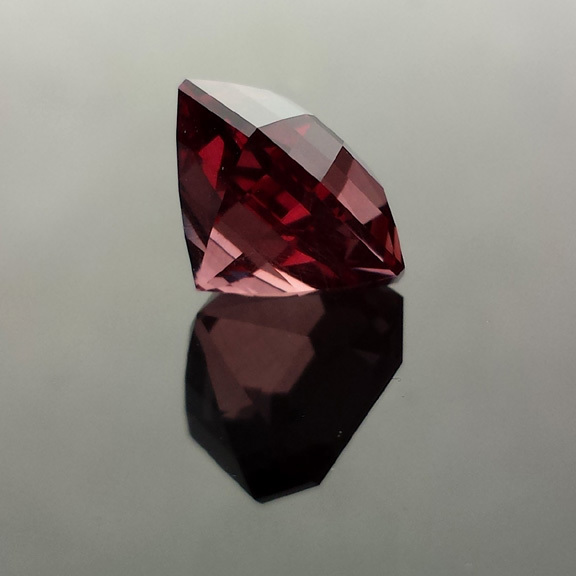 The gem is so much better in real life then the pics... believe me, you'll be VERY pleased with this beauty. 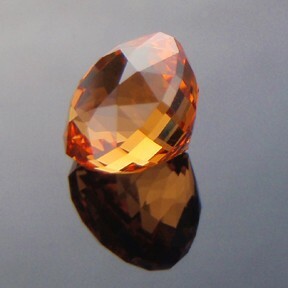 A fabulous mandarin garnet gemstone of rare quality. 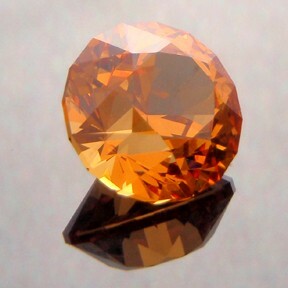 Comments : A very nice light orange grossular garnet from Mali. 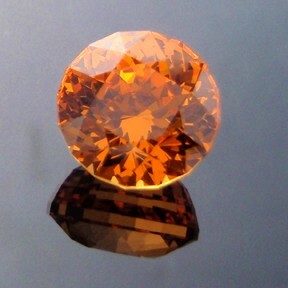 These are very bright stones when cut and this one certainly sparkles. 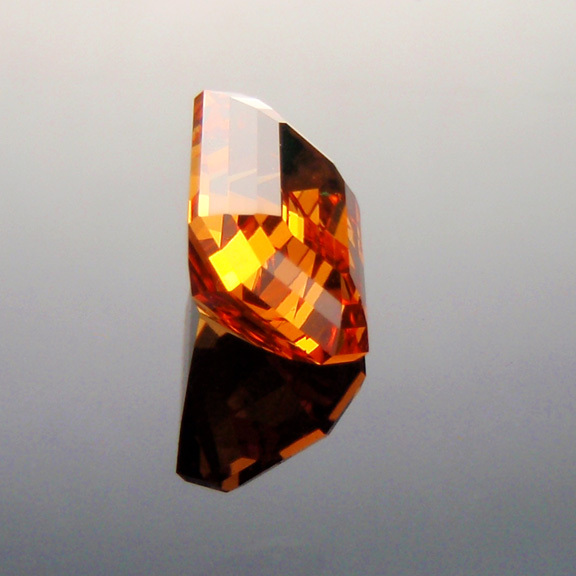 There are some minor inclusions that are common in garnet. 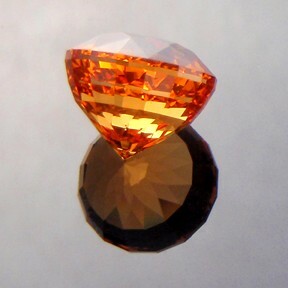 The garnet is more orange in person then the pic shows. 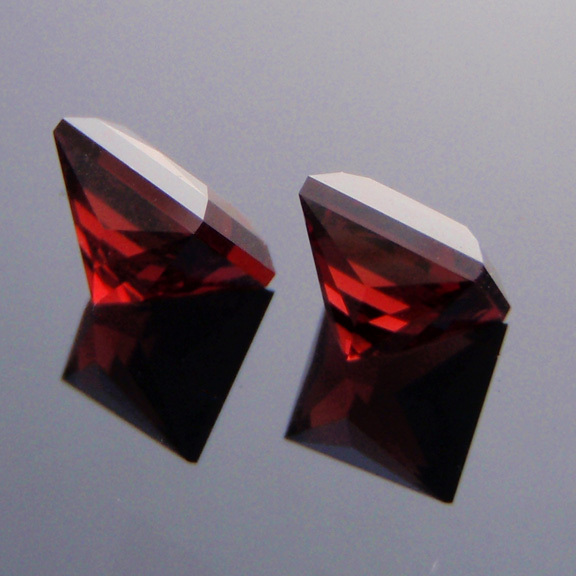 Comments : A lovely pair of matching garnets cut in the classic princess cut design. 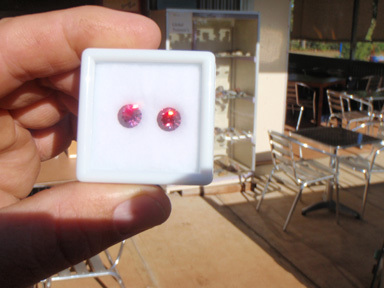 These two stones were cut from the same piece of garnet that was found out at Harts Ranges in central NT, Australia. 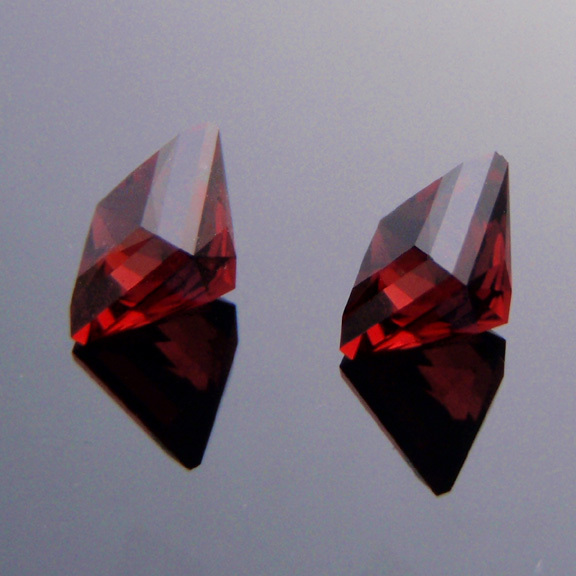 These garnets will make a very nice pair of earrings. Comments : This is a beautiful fanta orange spessartite garnet from Tanzania. 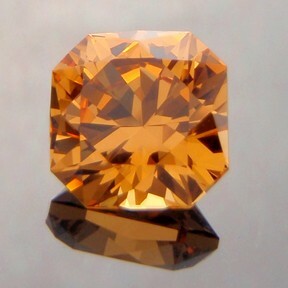 Gems over 2 carats in this material are scarce and this is a beauty. 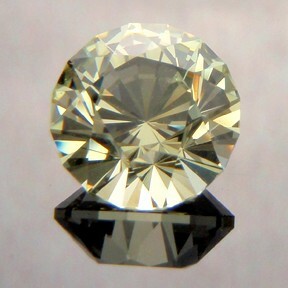 It is lovely and bright and cut in the classic Round Brilliant. There are some minor inclusions that are common to garnet including a small amount of silk/needles. These inclusions do not detract from the appearance of this gem. 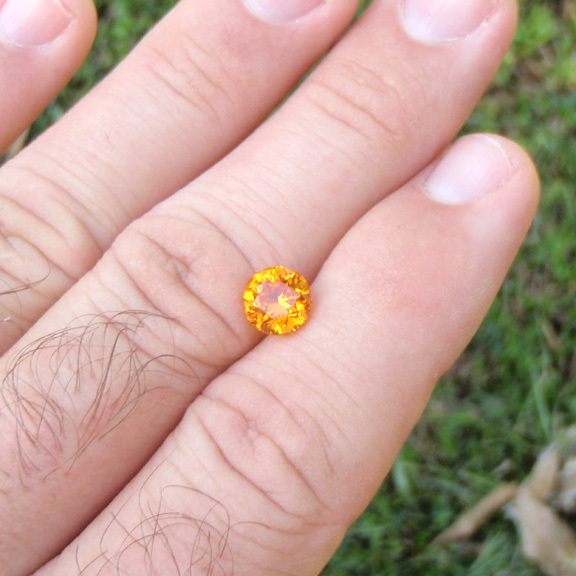 This gem is alot more bright and orange in person than it appears in the photo. 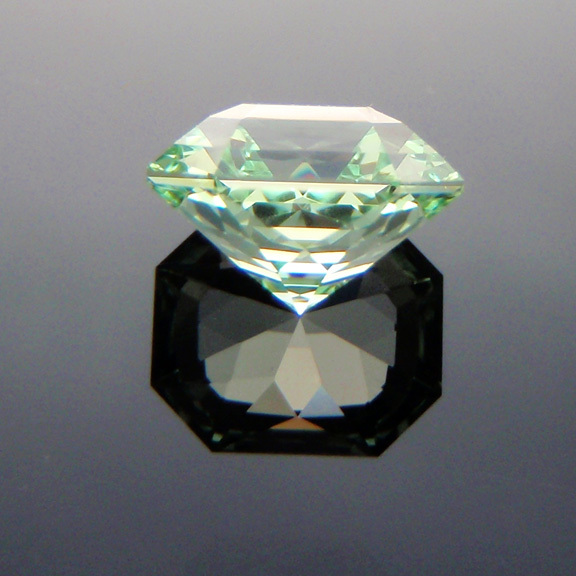 This is a top little performer! 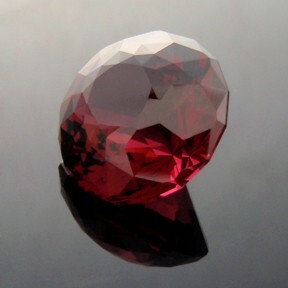 Comments : An absolutely magnificent malaya garnet. 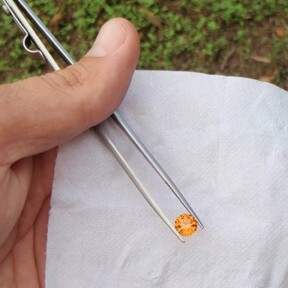 This is a unique, one-of-a-kind gemstone. 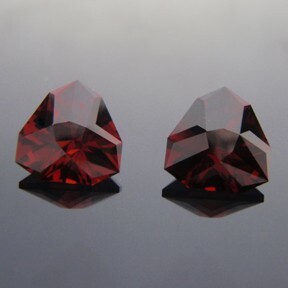 Garnets of this size and quality are very few and far between, more so considering it has been precision hand cut. 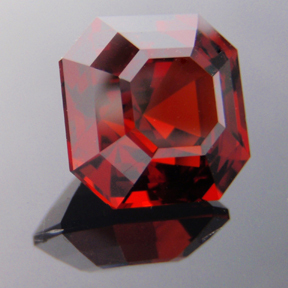 The deep red colour is beautiful and this type of garnet is a �nightstone� as it performs wonderfully under incandescent lights. 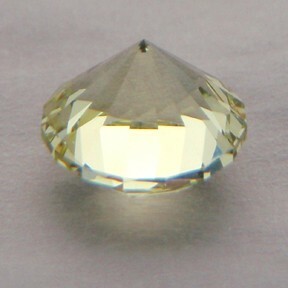 There is a small veil near the pointy end but otherwise nice and clean. 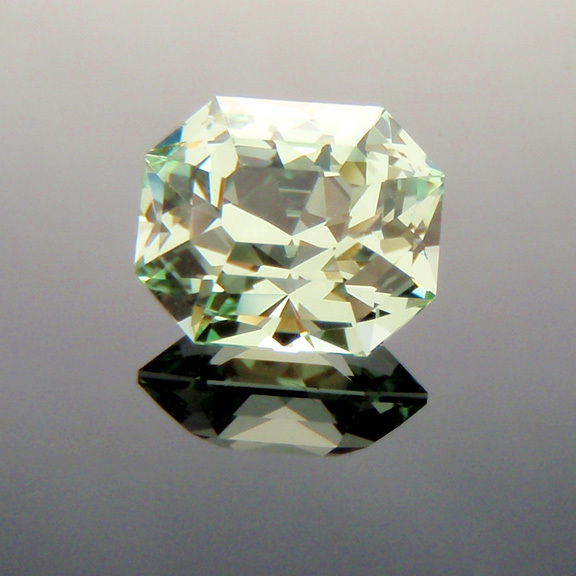 An exceptionally fine gem! Comments : A delicious fanta orange spessartite garnet from Tanzania. 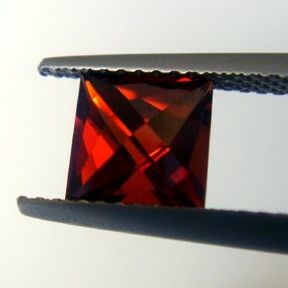 It is cut in the classic Flanders Brilliant square design that suits this garnet fabulously. 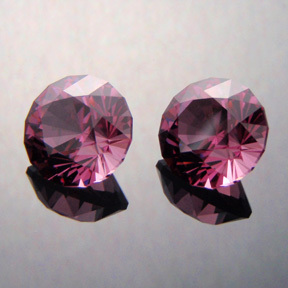 It is a little lighter in tone then #220 and #230. There are some minor inclusions that are common to garnet but nothing that detracts from the overall appearance of the gem. 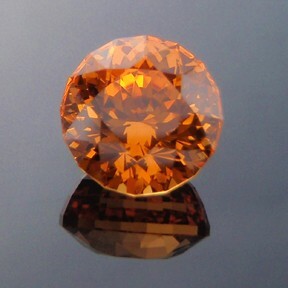 This gem is alot more bright and orange in person than it appears in the photo. 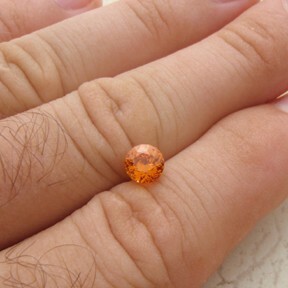 This is a spectacular little gemstone! 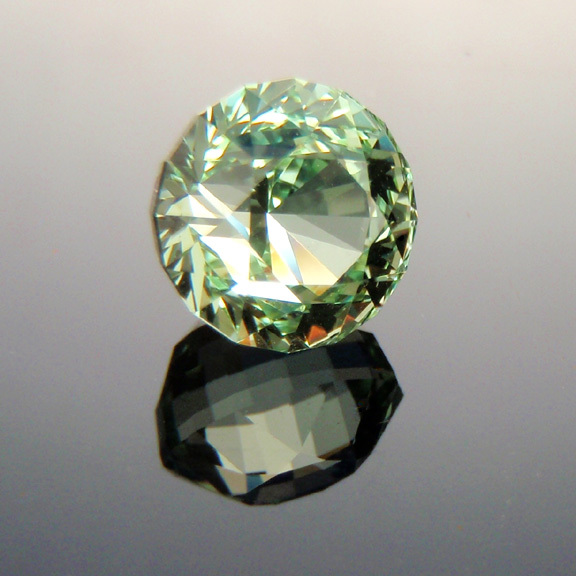 Comments : A very nice light green grossular garnet from Mali. These are very bright stones when cut and this one certainly sparkles. There are some minor speck-like inclusions that are common in garnet. Comments : A very nice light green grossular garnet from Mali. 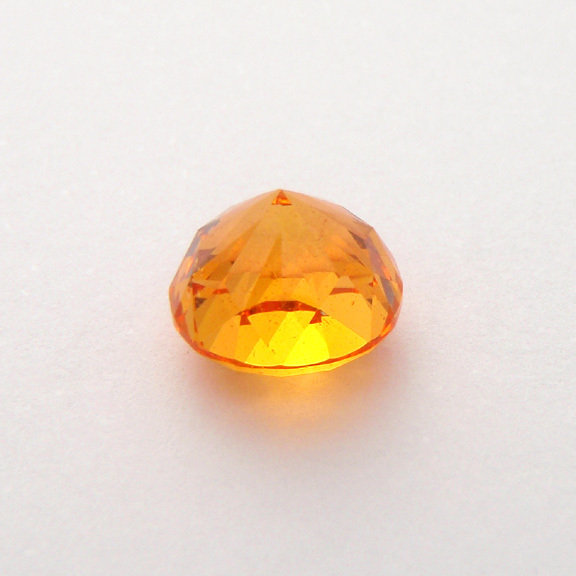 These are very bright stones when cut and this one certainly sparkles. 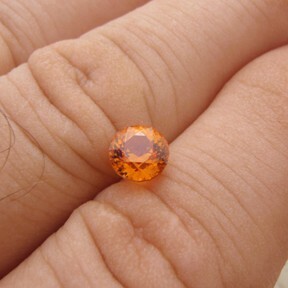 This is a good large size for Mali garnets are they are generally fairly small. 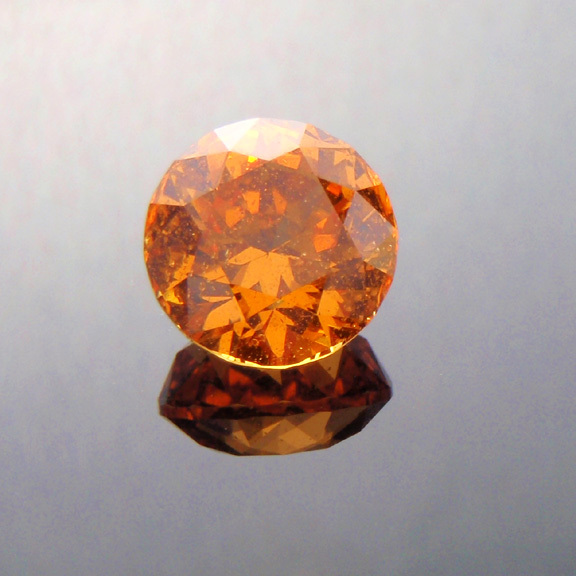 There are some minor speck-like inclusions that are common in garnet. 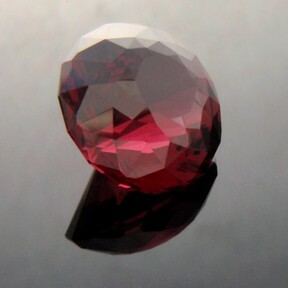 Comments : This is a lovely, good sized rhodolite garnet with the classic rhodolite colours of pink, purple and red. 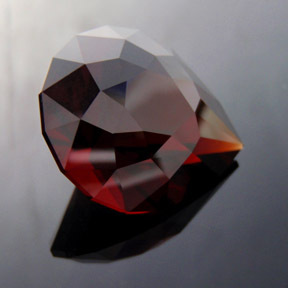 It is not overly dark like so much garnet that is around, rather it is about medium on the saturation scale and this, combined with the elegant pear cut makes for a very appealing stone. This stone comes from a location (Kangala) which is renown for its rhodolite garnet. It does have some of the silky inclusions that are common to this material but it does not detract from the overall beauty of the stone. 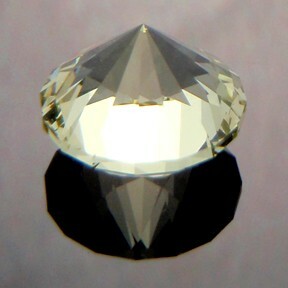 There is a very small inclusion veil just under the girdle on the pavilion which I don't think will be noticeable once it is set. It will make a gorgeous ring stone. 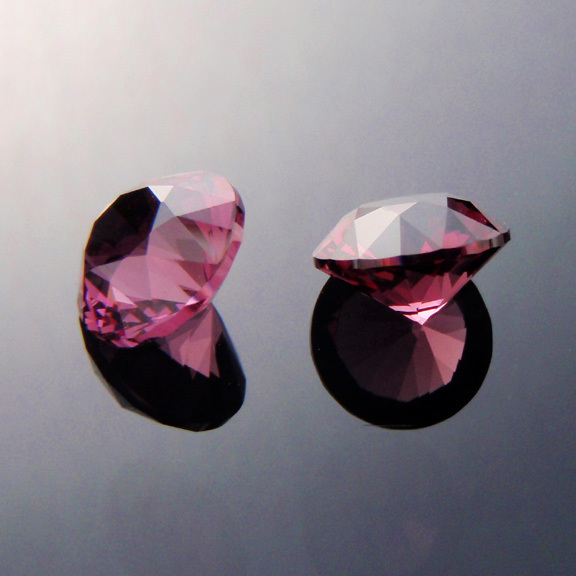 Precision cut rhodolite garnets of this size, colour and pedigree are not easy to come by. 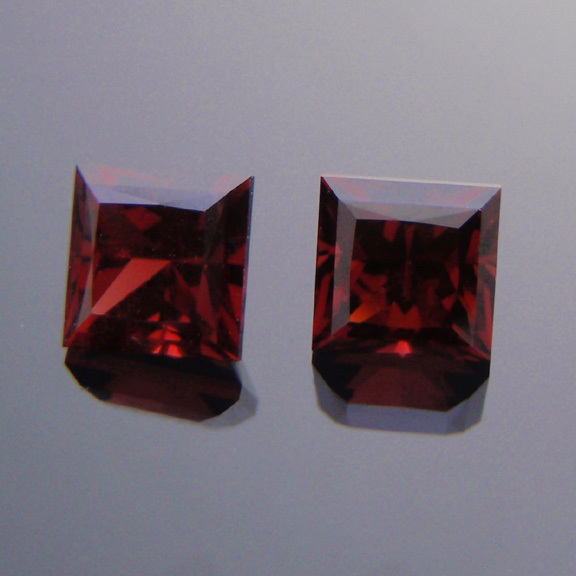 Comments : A nice rich red garnet in a matched pair. 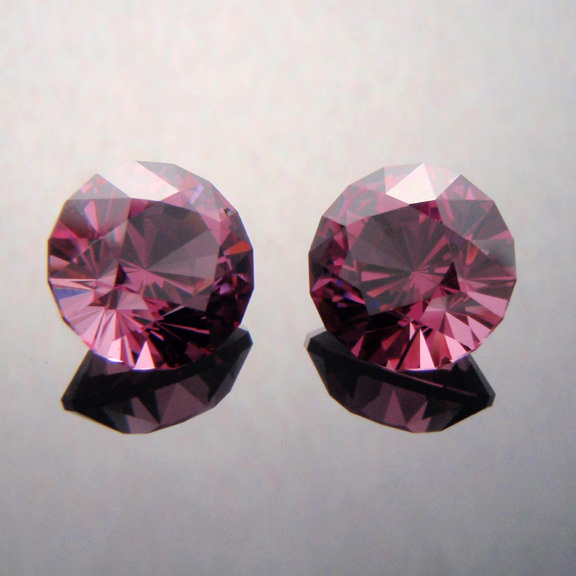 This design has good flash and is excellent for earings. 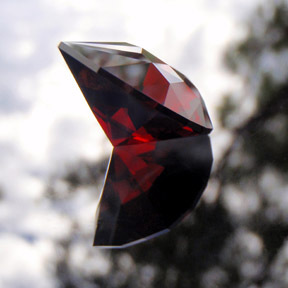 Comments : There's a party going on inside this gemstone and you're invited! 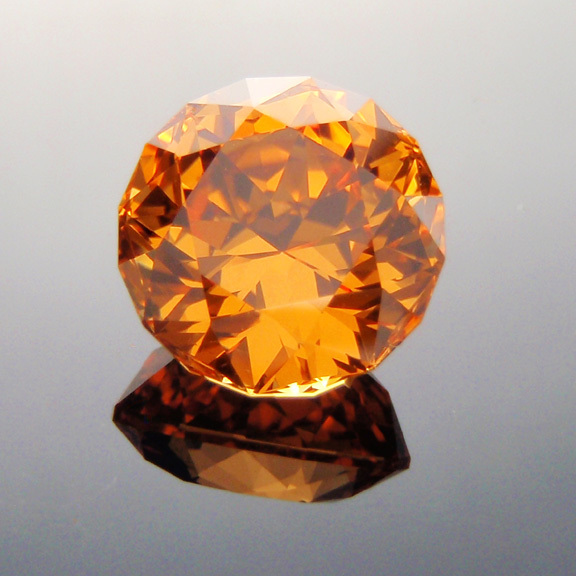 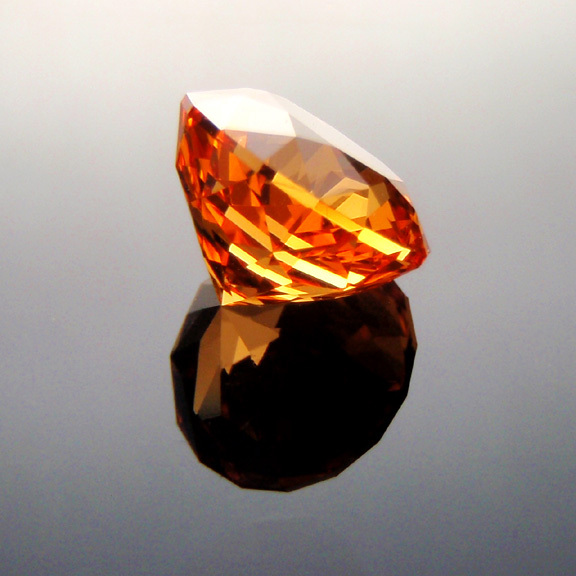 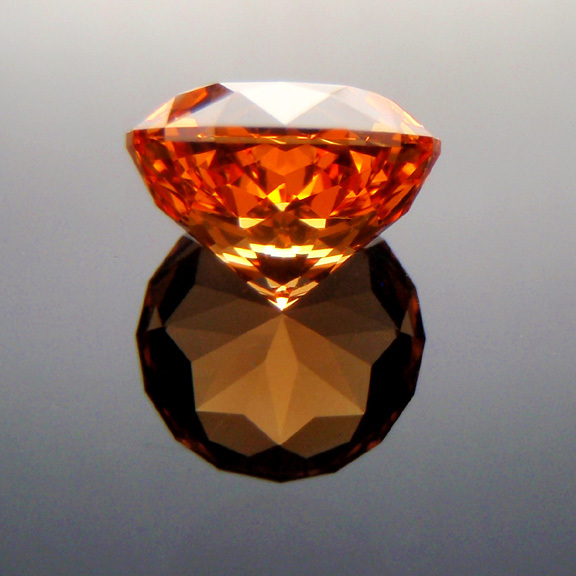 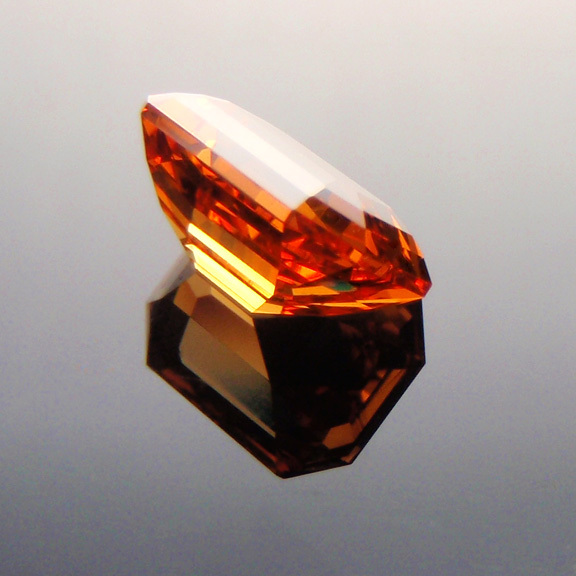 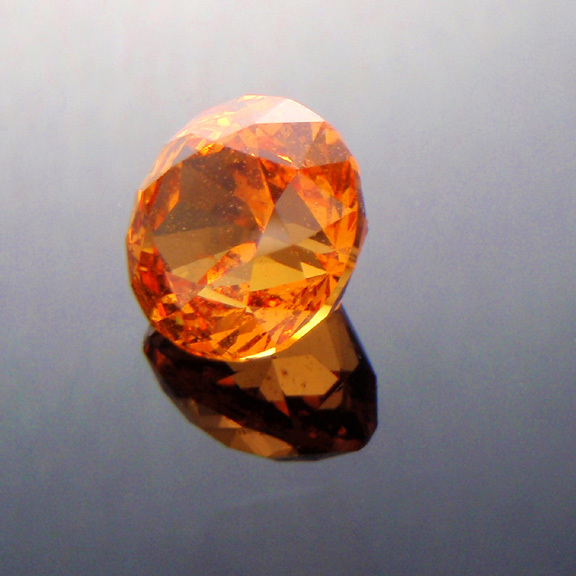 This is a stunningly bright "fanta" orange spessartite garnet from Tanzania. 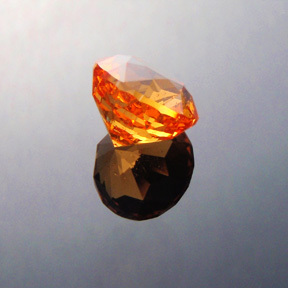 It is cut in my "Acorn" design which turns this garnet into a dazzling fireball... it is as if the sun came down and decided to party. 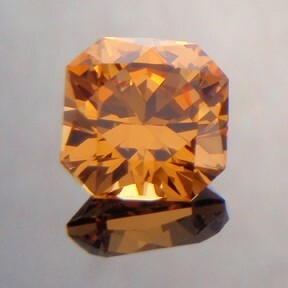 The colour is devine and is that highly desirable "fanta" orange. 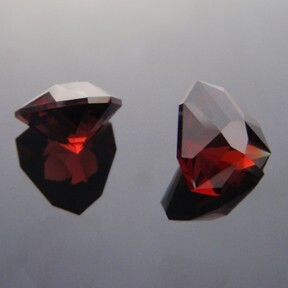 These garnets are becoming increasing scarce as the deposits become exhausted and I personally think a very good investment because the prices on these will only go up. This gem would look fabulous as a solitare ring cause it surely will do all the talking! There are several very minor small veils which you really need a loupe to see... they do not detract from the appearance of the gem at all. 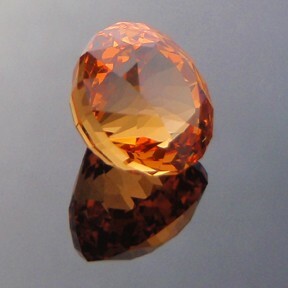 This is really a dazzling gem and one you will be very happy with. Comments : A nice rich red garnet. 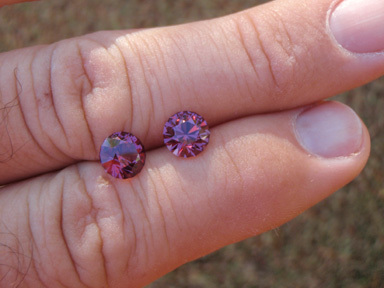 If required, a matching pair can be cut for earings. 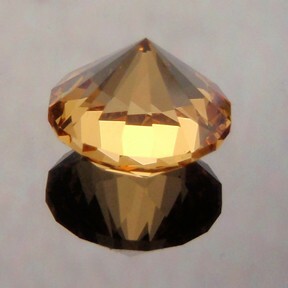 This design has good flash and is excellent for earings or a ring. 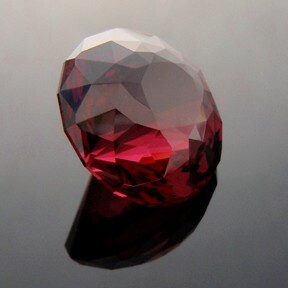 Comments : This is a very dark coloured almandine garnet from Harts Range in Central Australia. 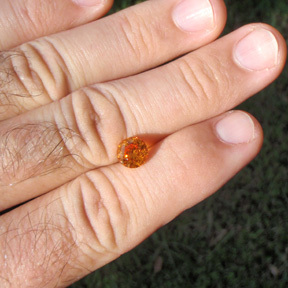 The garnet from this locality is usually very dark and is hard to find light coloured material. 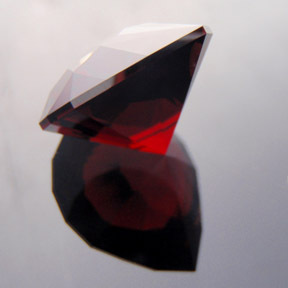 The gemstone has deep flashes of blood red and is cut in a modern fan variation. 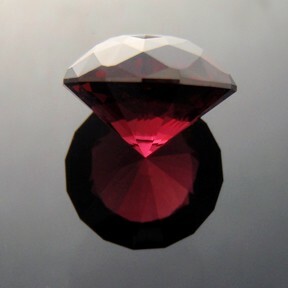 Comments : An exceptional rhodolite garnet cut in a stunning round dome. 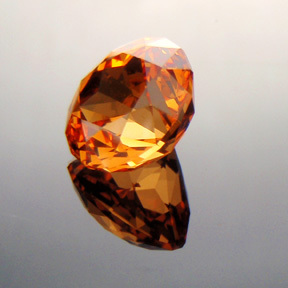 This is a stone that is destined for a big chunky gold ring. 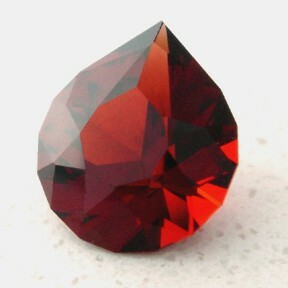 It is not too dark like alot of garnet, lovely colours. 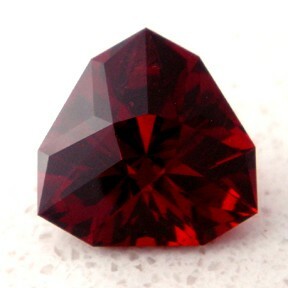 Comments : A nice rich red garnet. 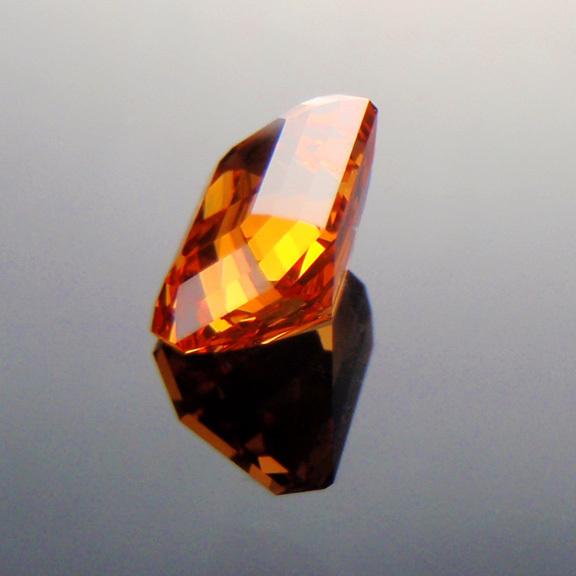 Comments : An exceptional spessartite garnet from Nigeria. 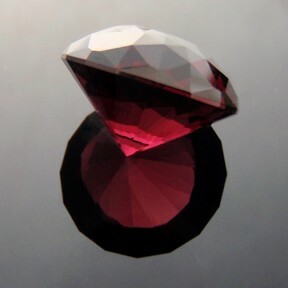 This has the deep luscious red colours which are absolutely gorgeous. You rarely see this sort of gem in the Asscher Cut design so that adds to its allure. 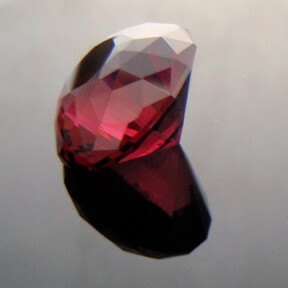 A very special and unique gem. 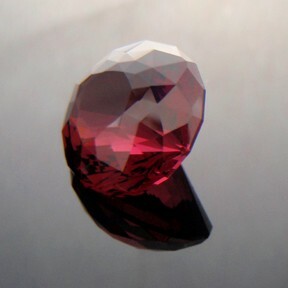 Comments : Well folks, when I first looked at this garnet after it came off the dop and was cleaned up it took my breath away. 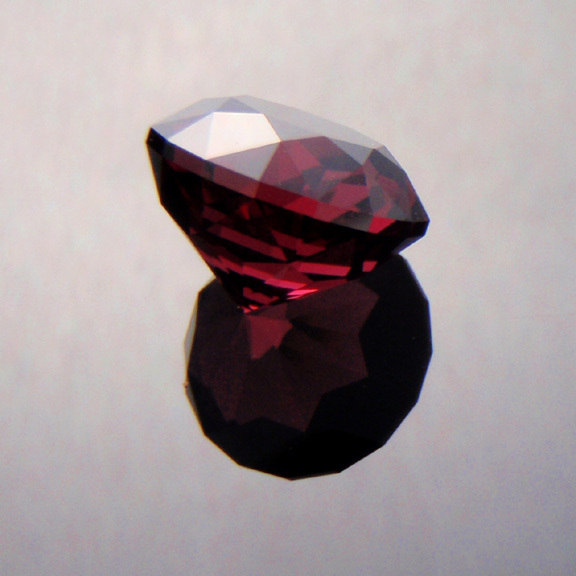 The photos do not do it any justice... it is simply stunning. 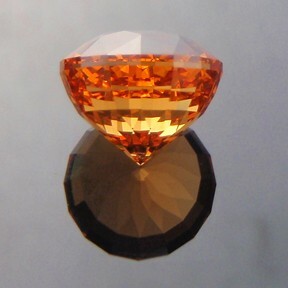 The colours are rich and deep and gorgeous. 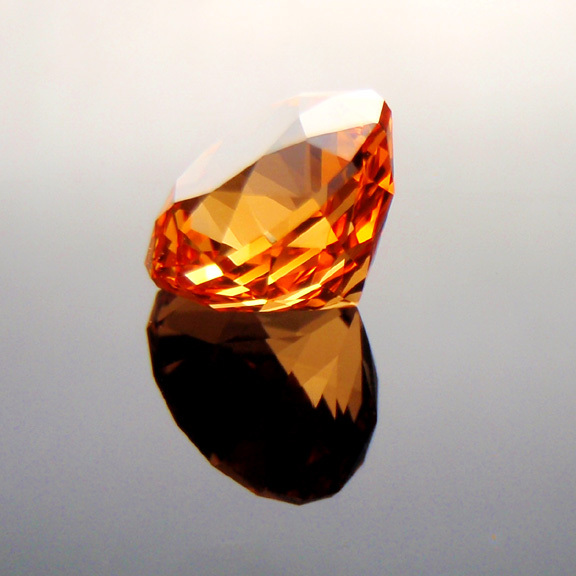 The gem is not dark... simply rich and luscious. 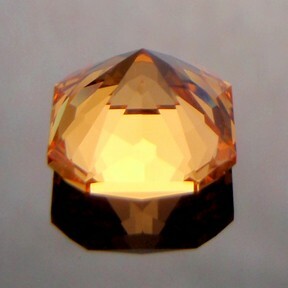 There is a small inclusion veil near one edge of the pavilion that is all but invisible when viewed from the top. 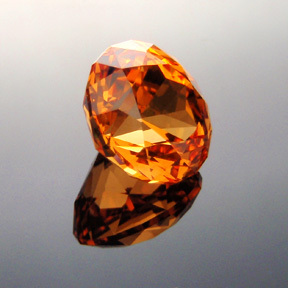 This is one seriously nice gem! Birthstones : Garnet is the birthstone for January. 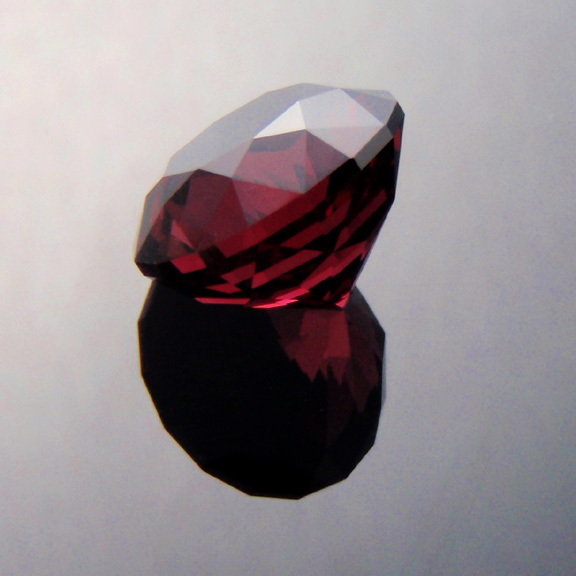 Garnet is the ayurvedic birthstone for January. 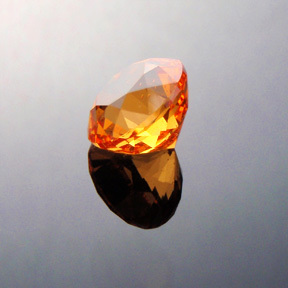 Garnet is the birthday stone for Tuesday. 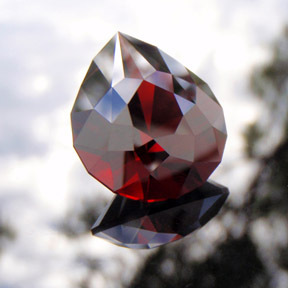 Garnet is the zodiac stone for Aquarius. 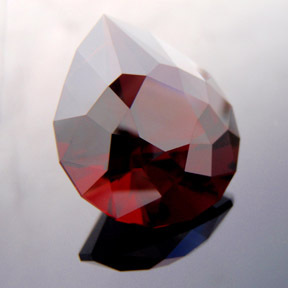 Comments : Garnets are quite a fascinating group of minerals once you get into them. Chemically they are complex and confusing and often very hard to clearly identify what a particular stone is... is it a pyrope, or rhodolite, or almandine? 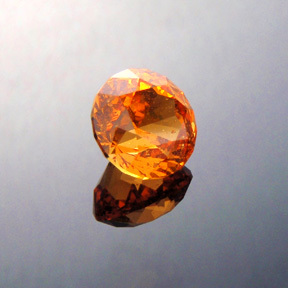 Garnets are found just about everywhere in the world and have a long and ancient history. 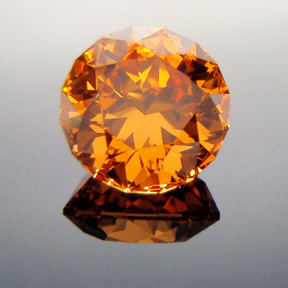 They have long been popular as jewelry and the cystals much sort after by mineral specimen collectors. Pyrope : Red to Brown, RI 1.720 - 1.756, Density 3.62 - 3.87, Mg3Al2(SiO4)3 Magnesium Aluminium Silicate. 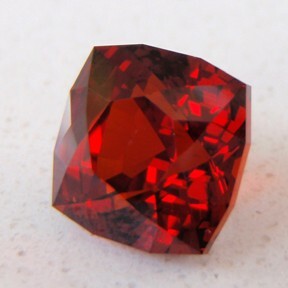 Name comes from the Greek word "fiery" and has always been a popular fashion stone, once called the "Bohemian Garnet". Rhodolite : Red to Brown, RI 1.720 - 1.756, Density 3.62 - 3.87, Fe3Al2(SiO4)3 Iron Aluminium Silicate. 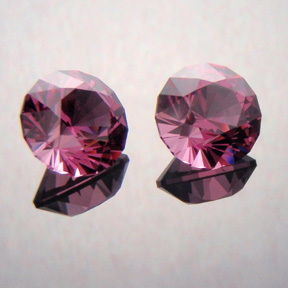 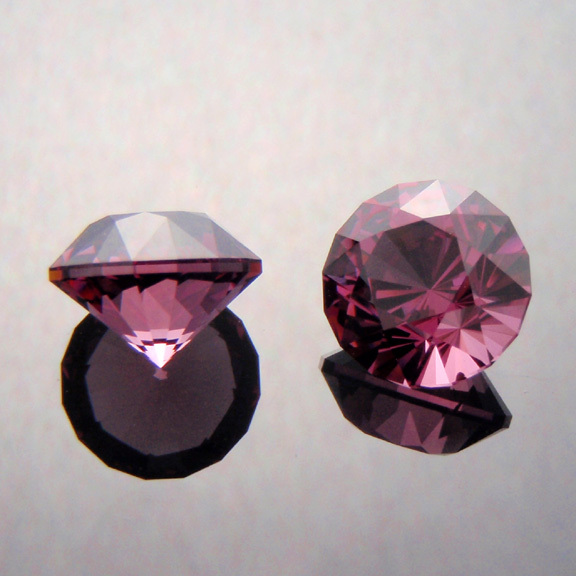 Rhodolite is a variety of Pyrope and has gained much popularity of late. 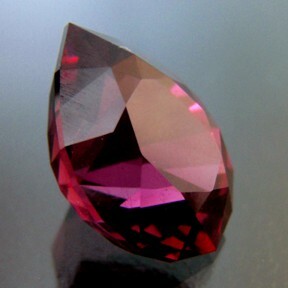 Some of the nicest rhodolite comes from the Umba Valley in Tanzania and is called Umbalite. Spessartite : Orange to Red-Brown, Fanta Orange, RI 1.79 - 1.82, Density 4.12 - 4.18, Mn3Al2(SiO4)3 Manganese Aluminium Silicate. 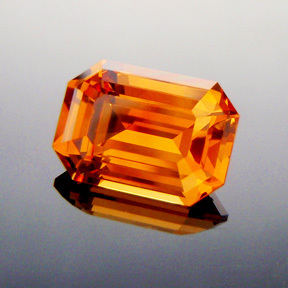 It is believed that the name comes from the Spessart in Germany where it is found. 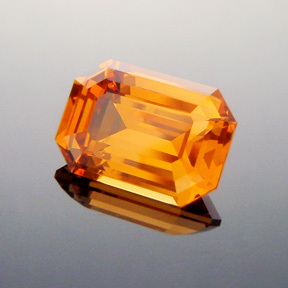 Some amazing spessartite comes in a very bright fanta orange colour. Deposits of this material are very small and found in Namibia and Loliondo, Tanzania. This material also goes by the name Mandarin Garnet because of the colour, as well as being called Kunene Spessartine due to the primary source being in the alluvial deposits of the Kunene River between Namibia and Angola. 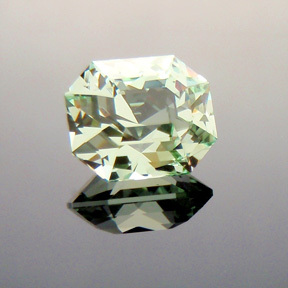 You can see how confusing it can be with all these different names. 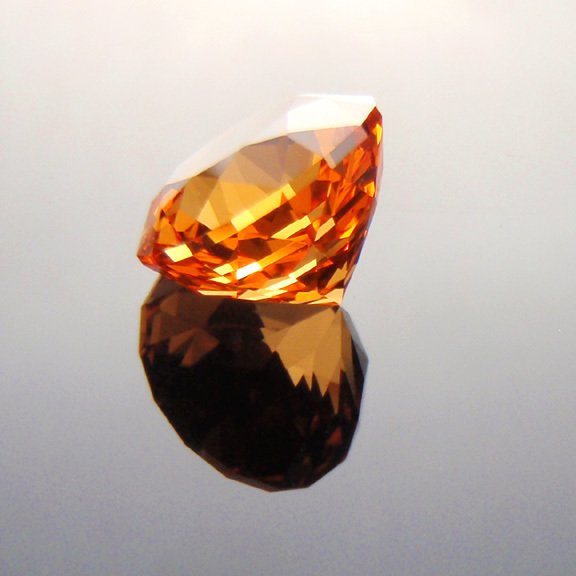 This fanta orange spessartite garnet is very popular and for good reason... the colour is stunning with fabulous brightness and sparkles, plus this material is getting very rare as the deposits become mined out. 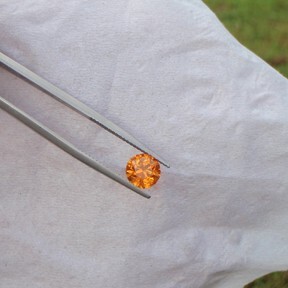 Grab this material when you can because it won't be around forever. 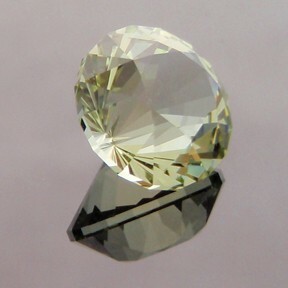 Grossular : Green, Yellow, Brown, RI 1.734 - 1.759, Density 3.57 - 3.73, Ca3Al2(SiO4)3 Calcium Aluminium Silicate. 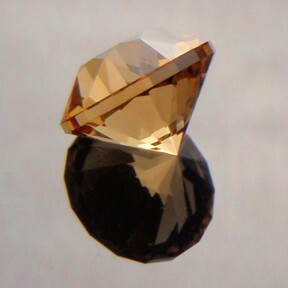 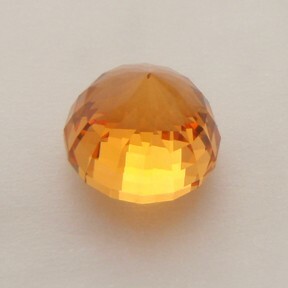 Latin for gooseberry, grossular garnet cuts a very bright light gem. 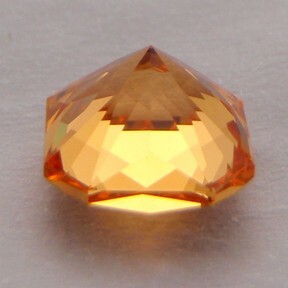 Apparently it has only been known since 1966 in gemstone quality. Varieties of grossular are : Hessonite - a cinnamon brown red orange stone; Hydrogrossular - is an opaque massive green variety, sometimes called Transvaal Jade and Garnet Jade; Leuco - is a colourless variety. 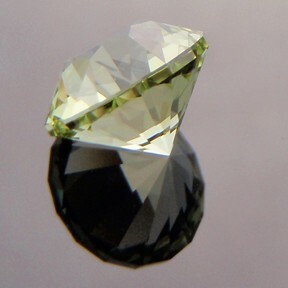 Tsavorite : Deep Green. Is a variety of grossular and perhaps one of the rarest and most expensive of all the garnets. 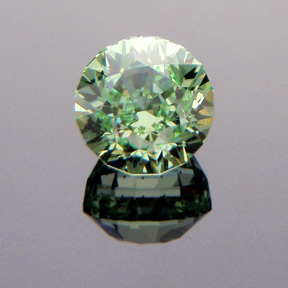 This particular variety is a stunning rich green and tends to be only found in very small stones. 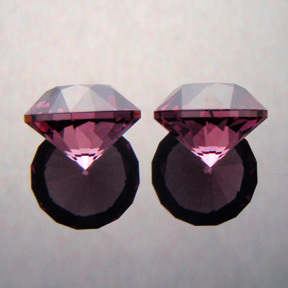 Cut gems over 2 or 3 carats are considered scarce and are collector stones. 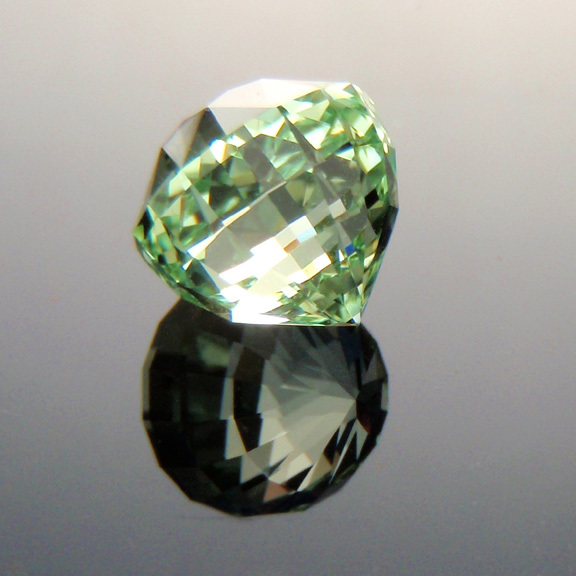 The name Tsavorite was coined only recently in 1974 by Tiffany & Company after Tsavorite's discovery in the Tsavo National Park, Kenya. Tsavorite garnets are much sort after and compete easily with emeralds - plus they have the great advantage of not being treated (oiled) as virtually all emeralds are. 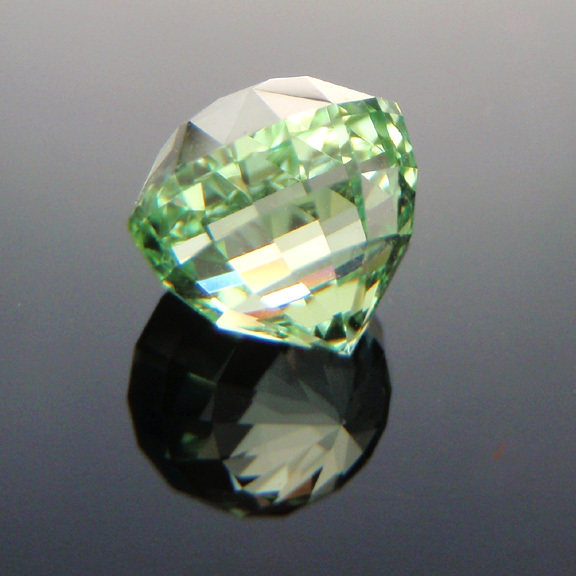 Tsavorite gems have a higher brilliance, fire with lots of sparkles and are more durable. Emeralds are almost always heavily included whereas Tsavorite gems tend to be very clean. Merelani Mint : Mint Green. 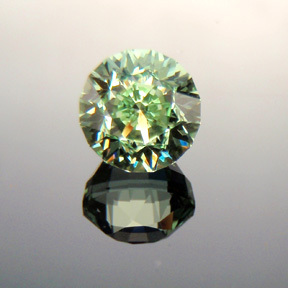 This beautiful garnet is a variety of grossular and is closely related to Tsavorite. 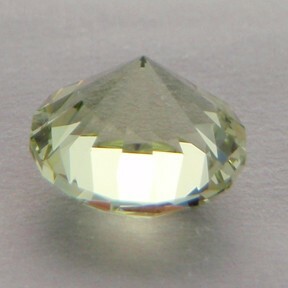 It is named for the Merelani Hills in Tanzania where it is found. 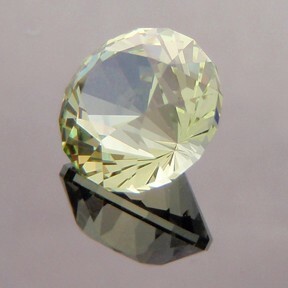 This material is a lovely light mint coloured stone and like Tsvaorite is generally only found in small sizes. 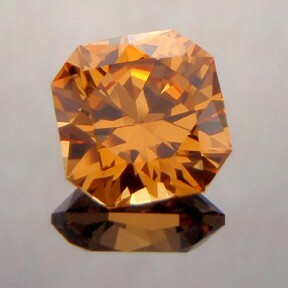 It has become very popular and demands a high price due to its scarcity. 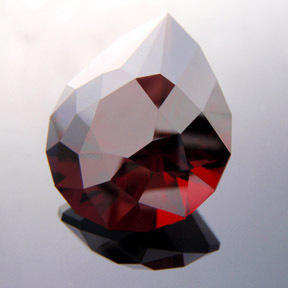 You can see an example of facet rough merelani mint garnet here.